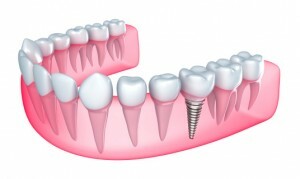 Dental implants in Lynchburg can restore not only one tooth, but multiple teeth at the same time. This is usually accomplished by placing an implant-supported dental bridge or denture. The advantages for the patient include not only an enhanced smile but restored functionality and a better, healthier quality of life. Dental bridges are an effective way to restore missing teeth. But traditional bridgework is limited by the need for a viable tooth on either side of the restoration. It also requires the use of dental adhesive, which can sometimes fail over time. Implant-supported bridges avoid these problems. The dentist places an implant on both sides of the gap in the patient’s smile, and uses these to attach a series of prosthetic teeth all at once. Not only does this make the bridgework look more natural than the traditional approach, the presence of the titanium posts makes the restoration far more secure. Many patients report an implant-supported bridge lasting for 30 years or more. Compare this to the 5 to 7 year lifespan of a traditional bridge and the advantage of implants becomes clear. Traditional dentures have helped many patients to enjoy a better quality of life. But, like traditional bridgework, they suffer from serious limitations. They require the use of messy adhesives, and they restrict the wearer’s diet. They can also come loose at the worst possible times, such as during social events or professional meetings. Even worse, they can lead to bone resorption, a problem that may affect not only the patient’s appearance but his or her health. Implant-supported dentures are a better option for most patients. The denture is secured by a series of titanium posts that fuse with the wearer’s surrounding bone. The patient can remove the denture at will for cleaning or right before bed. The number of implants used for the process can vary from 2 to 5, depending on the patient’s oral profile. An implant-supported denture is especially beneficial for the lower jaw, since traditional dentures for this part of the mouth tend to be unstable. What’s the Process Like for Receiving an Implant-Supported Restoration? Receiving an implant restoration of multiple teeth usually occurs over 3-4 separate appointments. During the first procedure, the dentist will place the actual implants. After this, there will be a waiting period of a few months to allow the implants to fuse with the surrounding bone. This is necessary for giving the final restoration its strength. During the second appointment, the dentist will place supportive abutments that will help to secure the final restoration. About two weeks later, these will be replaced with permanent abutments. At this time, the dentist will probably make an impression of your gum tissue. This will be used to create the final restoration. The final step is to try the actual restoration itself for fit and comfort. Assuming that it meets your expectations, you will then be able to go forward in life with your restored smile. The information in this post is presented as an introductory overview to the topic. Only an implant dentist in Lynchburg can give you the details you need to make an informed decision on this important topic. For many patients, an implant-supported bridge or denture can be the key to a happier, healthier, more fulfilling life. Dr. James M. Peery III is proud to work alongside his father, Dr. James M Peery, Jr., in providing top-quality dental care to the people of Lynchburg and the surrounding area. Dr. Peery III earned his DDS degree from the Medical College of Virginia and is a proud member of the American Dental Association (ADA). You can reach his office online or by calling (434) 847-5331.